We have a wide range of food on offer, sandwich cakes, sausage rolls, scones, meat pies, quiche, carrot cakes, chocolate cakes, preserves and sooooo much more. Tell us what you would like and we will try to arrange your order for you. Please see our price list page. 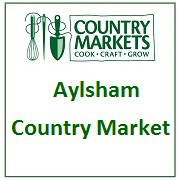 We do offer a local delivery service within 2 miles of Aylsham. Please also contact us if you are interested in joining us, as a producer of cakes, plants, crafted gifts etc. We always welcome new people.